Illustrations: 27 black-and-white photos, 4 maps, 5 line figures. 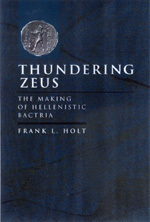 Thundering Zeus uses an innovative, interdisciplinary approach to resolve one of the greatest puzzles in all of Hellenistic history. This book explores the remarkable rise of a Greek-ruled kingdom in ancient Bactria (modern Afghanistan) during the third century B.C. Diodotus I and II, whose dynasty emblazoned its coins with the dynamic image of Thundering Zeus, led this historic movement by breaking free of the Seleucid Empire and building a strong independent state in Central Asia. The chronology and crises that defined their reigns have been established here for the first time, and Frank Holt sets this new history into the larger context of Hellenistic studies. The best sources for understanding Hellenistic Bactria are archaeological, and they include a magnificent trove of coins. In addition to giving a history of Bactria, Thundering Zeus provides a catalog of these coins, as well as an introduction to the study of numismatics itself. Holt presents this fascinating material with the precision and acuity of a specialist and with the delight of an admirer, providing an up-to-date full catalog of known Diodotid coinage, and illustrating twenty-three coins. This succinct, energetic narrative thunders across the history of Hellenistic Bactria, exhuming coins, kingdoms, and customs as it goes. The result is a book that is both a history and a history of discovery, with much to offer those interested in ancient texts, archaeology, and coins. Frank L. Holt is Associate Professor of History at the University of Houston, and author of Alexander the Great and Bactria: The Formation of a Greek Frontier in Central Asia (1989).